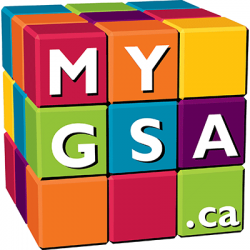 MyGSA.ca is Canada’s website for safer and inclusive schools for the lesbian, gay, bisexual, trans, queer and questioning (LGBTQ) community. Whether you’re LGBTQ or not you’ll find something interesting and helpful on the site. Join the discussion, get the resources you need, and spread the word! A Gay-Straight Alliance (GSA) is an official student club with lesbian, gay, bisexual, trans, two-spirited, queer, and questioning (LGBTQ) and heterosexual student membership and one or two teachers who serve as faculty advisors. Students in a school with a GSA know that they have at least one or two adults they can talk to about LGBTQ matters. The purpose of a GSA is to provide a much-needed safer space in which LGBTQ students and allies can work together on making their schools more welcoming for all members of school communities, regardless of sexual orientation and gender identity. Such groups also function as safe havens and supports for students with LGBTQ parents, other family members, and friends. A GSA is a student-run group that provides a safe place for any and all students to meet and learn about all different orientations, to support each other while working together to end homophobia, and to raise awareness and promote equality for all human beings. In addition to being a group dedicated to support, it also strives to educate the surrounding areas and the community on different gender and equality issues. The MyGSA.ca Equity and Inclusive Education Resource Kit was designed to provide everyone in the school with information required to support the creation and maintenance of safer and more inclusive school communities. In addition to the brief overview of significant Terms & Concepts you’ll find in this Introduction, there is a much lengthier section devoted to definitions further on as well as a section on Role Models & Symbols. All of this information should be helpful when planning events, assemblies, and projects in conjunction with the significant dates on the Queer Calendar. The Gay-Straight Alliance (GSA) Guide provides strategies for starting and maintaining student groups pertaining to LGBTQ matters. If you are an educator, check out the Information & Resources for Educators. If you are a guidance counsellor, check out the Resources for Guidance Counsellors. If you are an administrator, check out the Information for Administrators. If you are not a teacher, a guidance counsellor, or an administrator, give these sections to your teachers, your school counsellors, and your principal! There is also an Executive Summary of Egale’s Final Report on the First National School Climate Survey: Every Class in Every School. Download the Kit and get started today! This is an alphabetical list of LGBTQ focused scholarships, awards and bursaries available for those studying in Canada. Please see the corresponding links for further information regarding these opportunities including eligibility requirements, deadlines, etc… If you would like to list an opportunity here, or update an existent listing, please use the ‘Email-Us’ link found in the footer of this site. Speak Up—Student-Led Teacher-Facilitated Projects Speak up! Students like you are the heart of any school. We want to make Ontario’s publicly funded education system better, and that starts with you! You have a voice, and we want to hear what you have to say about your education. We want to help you make your school a place where everyone feels welcome and where you are empowered to speak your mind, get involved and become active citizens and leaders. Grants are available for student-led projects. Change happens when people come together to work on a shared idea or goal. – Superior academic achievement and quality research focused on sexual and gender minority studies and their application in advocating for sexual and gender minorities in educational and community contexts. – Undergraduates completing Specialist/Major in SDS combined with academic interest in study of Politics or demonstrated commitment to social justice. The 2014 Canadian Safe School Network/TD Award For Excellence Against LGBTQ Youth Bullying.